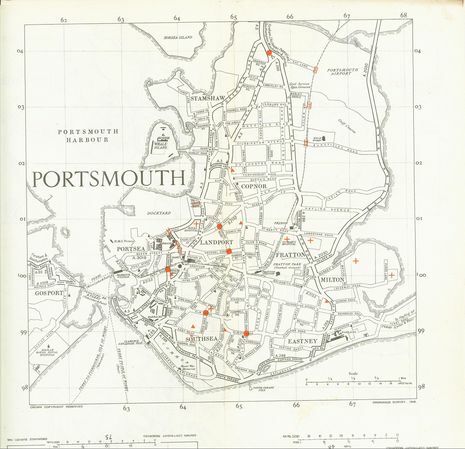 The city [of Portsmouth] was bombed extensively during WW2. Nazi German Luftwaffe night-time air raids began on August 24 1940 when 1,320 of high explosive bombs, 38,000 incendiary devices were dropped on the city, damaging The Guildhall, 30 churches, 8 schools, 1 hospital and over 80, 000 homes. 930 people were killed and 1,216 people were injured. While most of the city has since been rebuilt, developers still occasionally find unexploded bombs. Southsea beach and Portsmouth Harbour were military embarkation points for the D-Day landings on June 6 1944. Southwick House, just to the north of Portsmouth, had been chosen as the headquarters for the Supreme Allied Commander, US General Dwight D. Eisenhower, during D-Day. After the war, much of the city's housing stock was damaged and more was cleared in an attempt to improve the quality of housing. Those people affected by this were moved out from the centre of the city to new developments such as Paulsgrove and Leigh Park. The bombing took place during the period July 11, 1940 and May 1944, this period being known as the blitz. The word Blitz is a shortening of the German word blitzkrieg, meaning "lightning war," the literal translation of the German word "Blitz" is "lightning". Three of these attacks were regarded as major, 24-August-1940, 10-January-1941, 10-March-1941, with the rest being on a slightly smaller scale.